Just south of Cwm Prysor one of the underbridges is partly made from Barlow rail. This was of a huge cross section and was intended to be heavy enough to be laid directly onto ballast without the need for sleepers. It was tried on the GWR broad gauge as an alternative to Brunel's rail but, unsurprisingly, it was a complete failure. William Henry Barlow was also designer of the roof of St Pancras station, which was rather more successful! 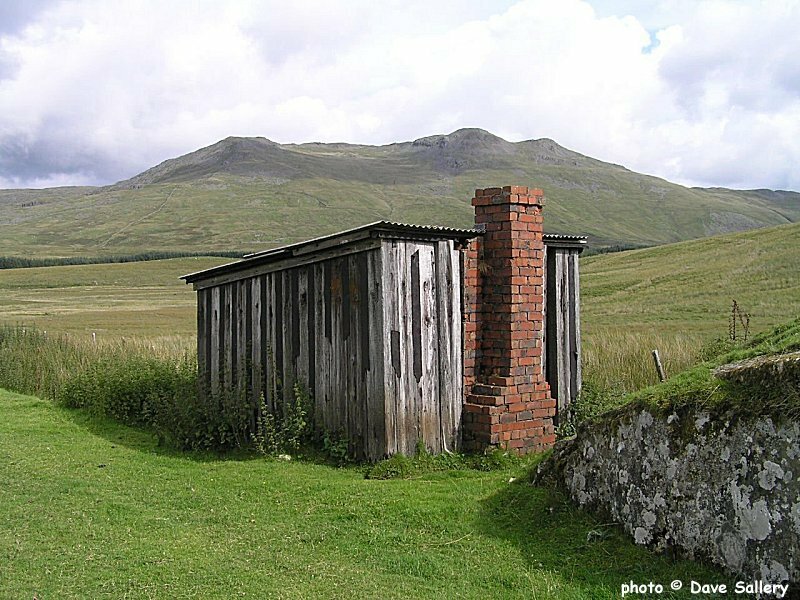 This permanent way hut is still remarkably complete even after 50 years of disuse. 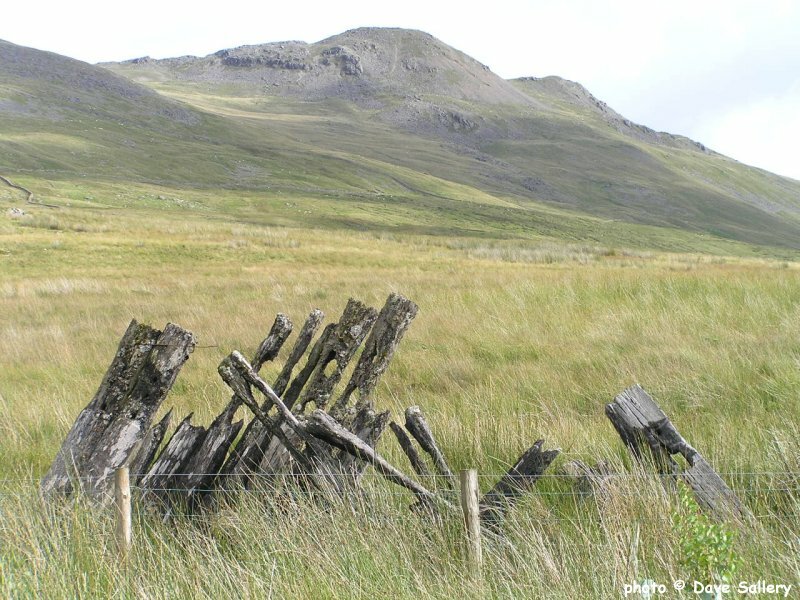 The mountain in the background is Arenig Fawr (2,800 feet / 854 metres). This section of the trackbed is also a permissive path. Several footbridges have replaced the now removed railway bridges. The harsh weather conditions required snow fences along the most exposed sections. These are the sad remains of one such fence. 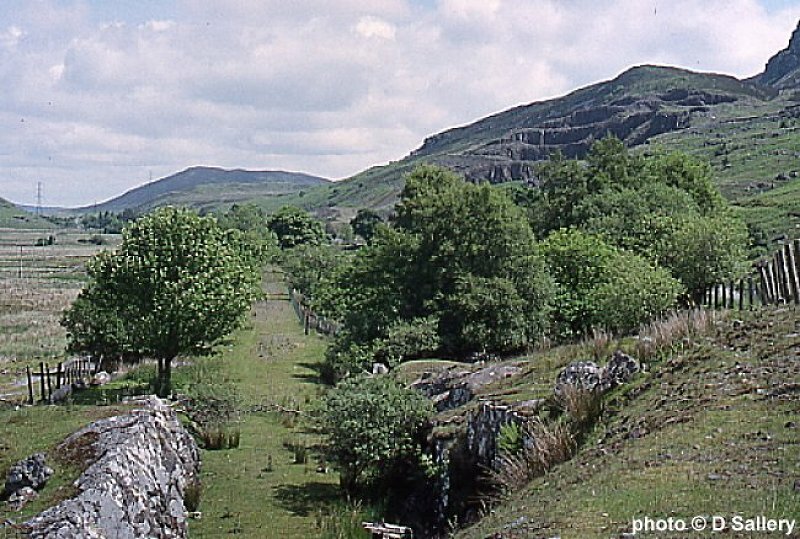 The trackbed looking towards Bala just north of the site of Arenig station. The granite quarry on the right was the other major source of traffic on the line. The station possessed a loop and was 1,135 feet/346 metres above sea level. The area around Arenig station has now been cleared and no trace of the facilities remain. 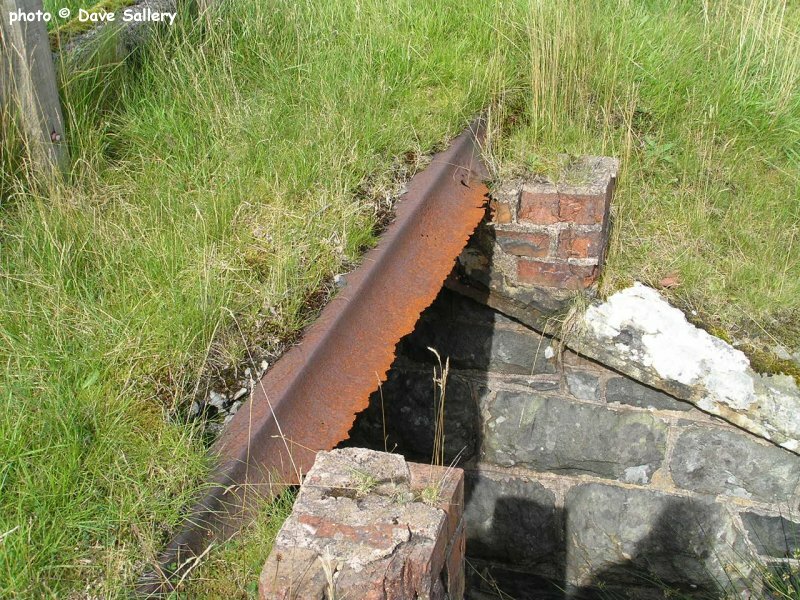 It was the building of Llyn Celyn which brought about closure of the line, complete closure being considered to be a cheaper alternative than building a deviation. The trackbed before it is submerged is marked by the line of trees in the middle distance. 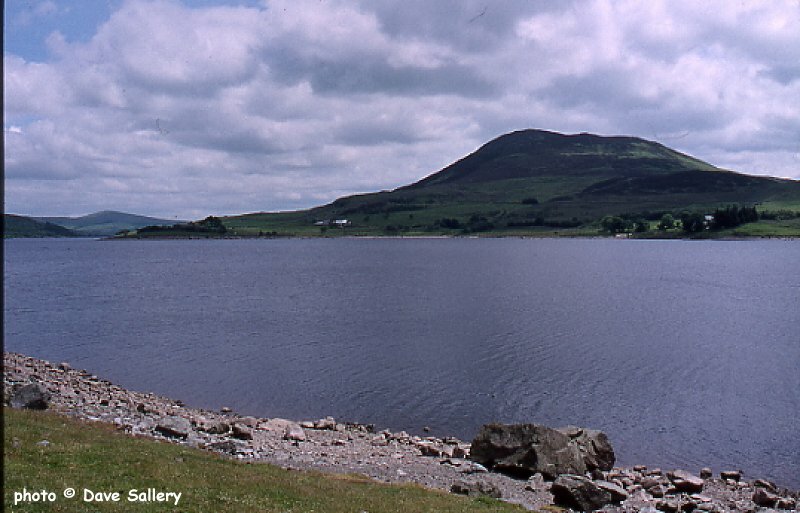 The building of Llyn Celyn led to the flooding of Capel Celyn village and caused uproar at the time. Llyn Celyn is used as a supply reservoir to control the flow of water in the River Dee/Afon Ddyfrdwy. 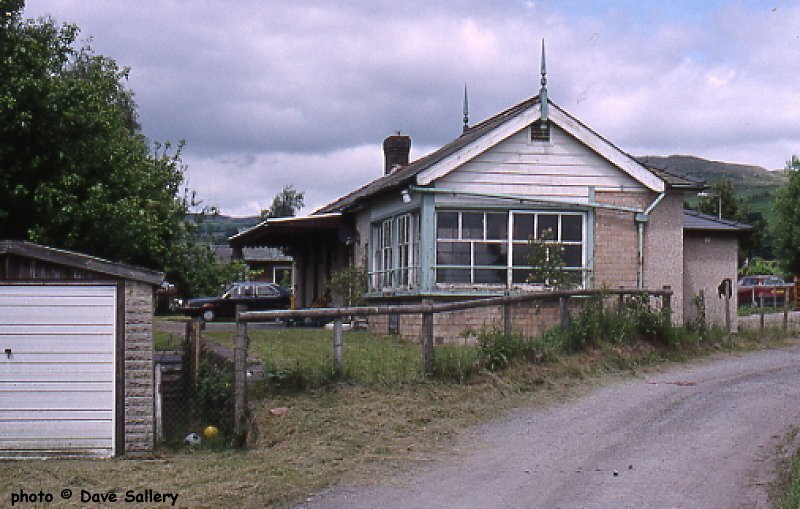 Frongoch is another station which has survived under private occupation. In this view, looking towards Trawsfynydd, the platform mounted signalbox is seen with the station building behind it. 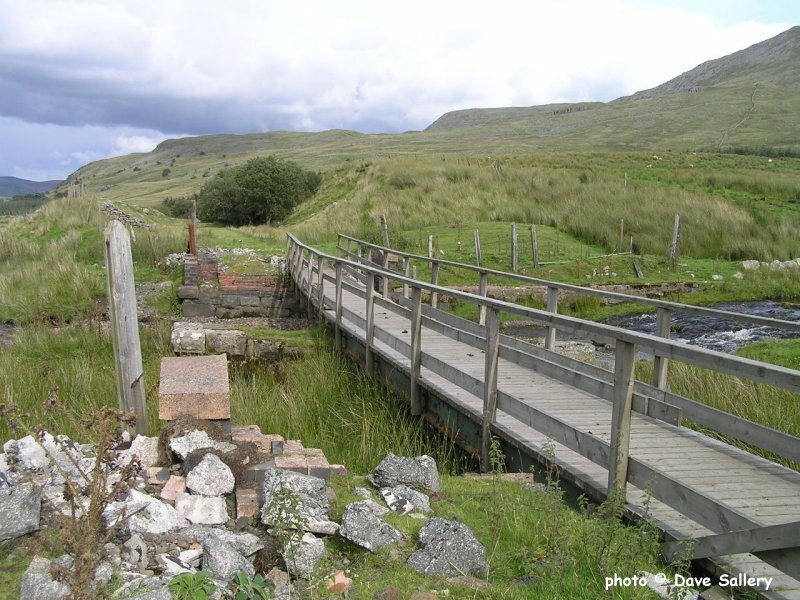 The site of Bala station looking from the site of the bridge which carried the Trawsfynydd line under the A494. The sole reminder of the once important railway presence in Bala is the ex GWR semaphore signal in the right distance. After closure of the Trawsfynydd line, Bala continued to be served by trains on the Ruabon - Barmouth line until closure in 1964. It was reached by a short spur from Bala Junction. Although the sign says Bala station, this was neither Bala nor Bala Junction but Bala Lake Halt on the Ruabon - Barmouth Junction/Morfa Mawddach line. It is the present day terminus of the Bala Lake Railway which uses the trackbed of the Barmouth line for four and a half miles as far as Llanuwchllyn. 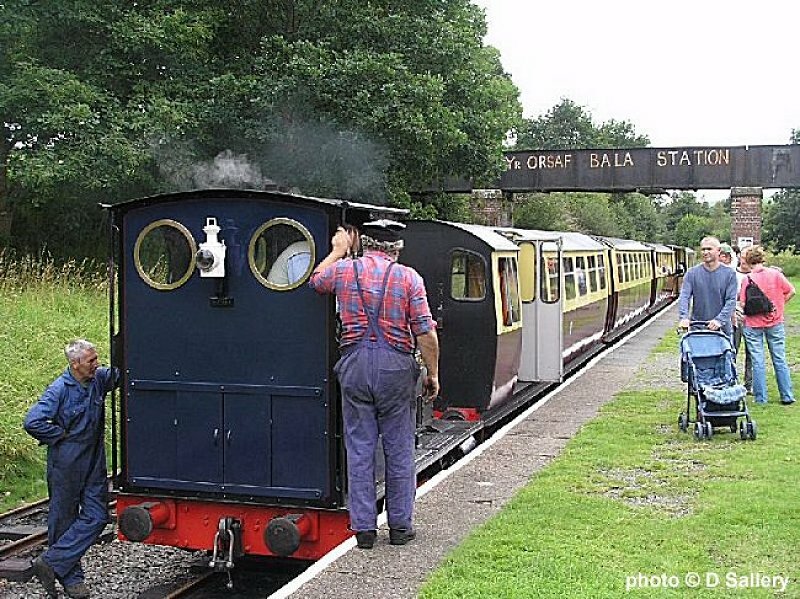 The two foot gauge line runs along the shore of Bala Lake/Llyn Tegid. 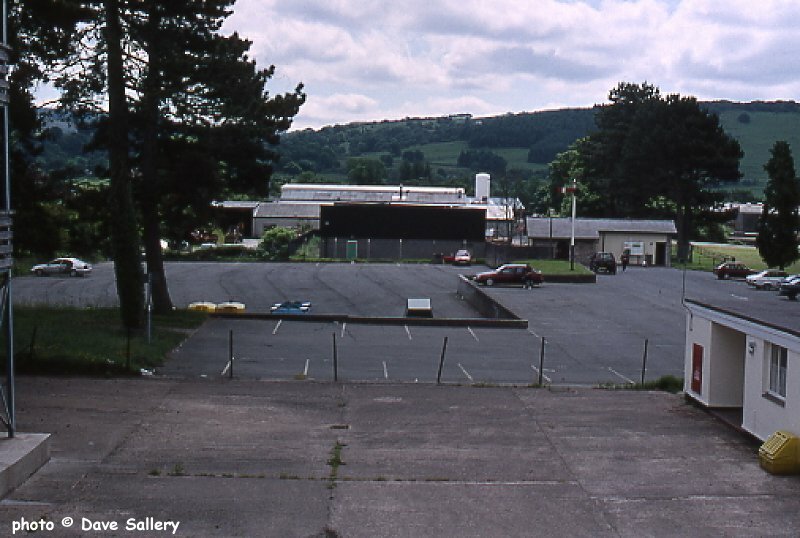 The site of Bala Junction station was about half a mile to the East and has now been landscaped. In this view "Holy War", an ex Dinorwic Quarry locomotive, has just arrived with a train.